Today starts a new Anything Goes themed challenge at Crafting From The Heart. The beautiful image on my card is a digi stamp from our sponsor Bugaboo, called Butterfly Rose Corner. I added the sentiment ("Hearty Congratulations" - in Finnish) on it with MS Word before printing the image out and coloring it with ProMarkers. 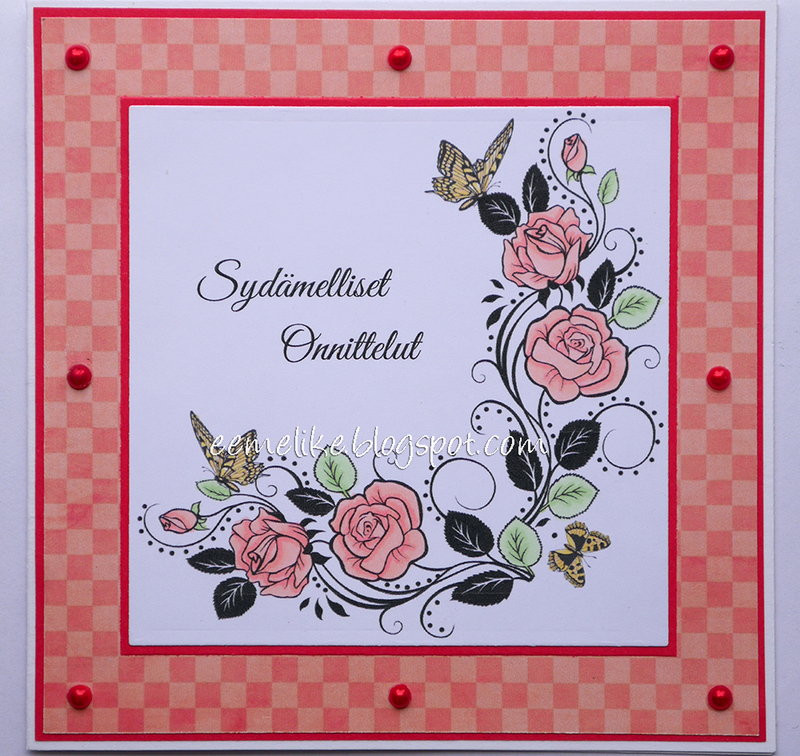 Square die is manufactured by Spellbinders. Designer paper is digital one from No Reimer Reason. To keep my card cas, I only added some flat-back pearls on the edges. Tänään starttaa uusi Mitä vain -teemainen haaste Crafting From The Heart -sivustolla. Kaunis kuva on digileima sponsoriltamme Bugaboolta, nimeltään Butterfly Rose Corner. Tekstin lisäsin siihen MS Wordissa ennen tulostamista ja promarkereilla värittämistä. Neliöstanssi on Spellbindersin. Kuviopaperi on No Reimer Reasonin digipaperi. Halusin pitää kortin simppelinä, joten koristeiksi päätyi ainostaan muutamia puolihelmiä reunoja kiertämään. Just beautiful! Thanks so much for playing in our ‘SUMMERTIME FUN’ challenge at Dies R Us! Please come back again soon! Your card is lovely! Thanks for joining us in the 'Summertime Fun' challenge at Dies R Us! Very elegant looking card! I love the image! Thanks for playing along with us at Scrapy Land Challenge #23! Wow, so pretty, love the Butterfly Rose image. Thanks for sharing on the Robyn's Fetish Challenge #276 - Things with Wings. This is lovely. So glad you shared it with us for the Scrapy Land Challenge. Thanks for joining us at colouring in scraoland!